SOLARSKIΝ™ is a cutting edge nanotechnology product of the latest generation, in the field of protective coatings for glass surfaces and it is exclusive for photovoltaic and solar thermal systems. Restores and protects the glass surface. Offers self-cleaning during rain and it cleans stains and spots easily with a simple wash.
Minimizes time and cost of cleaning. Solarskin ™ restores the surface of the PV modules that has been corroded over the years. The performance of the degenerated modules will be increased by a few percentage points immediately after application. Then, SOLARSKIN™ covers the PV modules with a film, carefully selected to have the appropriate thickness, which contributes to the smooth transmission of light. At the same time, it allows their self-cleaning under conditions of rain and they can be easily cleaned during periodical maintenance. The surface transforms to “non-stick” and thus prevents the accumulation of particles which cause shading, mechanical and chemical damage. Minimization of the demanded amount of water during preservation. Reduced use of chemical cleaners. 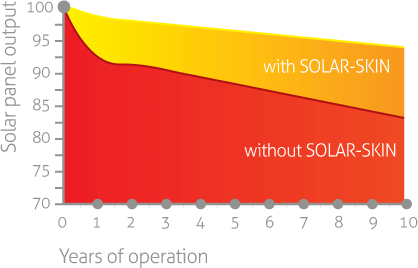 The lifespan of SolarSkin ™ is at least 7 years or 15,000 cleaning cycles! Quality management system in production by ISO 9001:2008.